In the past, we needed to take messy, time consuming, uncomfortable impressions to fabricate Invisalign® aligners. 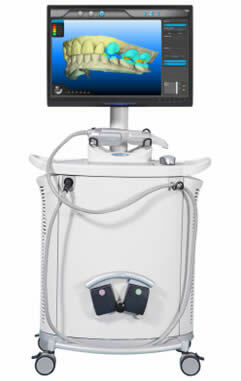 However, recently we have acquired 2 ITERO intra-oral scanners. The intra-oral scanner takes pictures of the teeth and fabricates a 3D image. Not only is this method more comfortable and quicker for the patient, it provides us with a more accurate image of your teeth and tissue giving us an improved fit and results with Invisalign®. Thank you for making “getting braces”? a fun and exciting time for our 13-year-old daughter. She looks forward to going to her appointments and loves seeing her new smile take shape. Beth made her feel right at home during her first appointment and did a great job explaining everything before we even began. Dr. Doshi is very knowledgeable and also has helped our daughter feel comfortable every step of the way.